Deep blue Sapphire (the birthstone for September) and white Diamonds have been a favourite combination for generations (even with the Royal family!) and this Pendant Necklace shows off both of these gems to great effect. 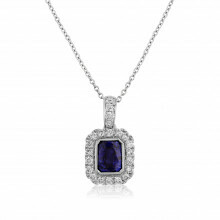 This Sapphire is oval cut and has a simple White Gold claw setting and gleaming Diamond surround. The Pendant is strung on a fine white Gold chain. A traditional and elegant design beautifully executed by exceptionally skilled jewellers.